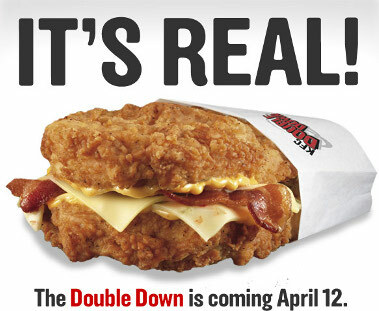 KFC is introducing its newest food item--bacon and cheese sandwiched between two pieces of fried chicken. MacDonald's had been selling a breakfast sandwich which used syrup-filled pancakes as bread, but I think KFC's offering takes the cake, or brings home the bacon, or whatever such sandwiches do. Looks great, doesn't it? The yellow stuff on the bottom layer appears to be cheese, so I can't tell you precisely what the orange stuff is on the upper layer could be. But I think people will flock from everywhere to try it anyway. You can't go wrong with orange stuff. It'll be just ten days, and then you can get your greasy hands on one of those things. If your hands aren't greasy, fear not. Placing them around those two pieces of fried chicken will fix that in no time.